This tasting was about comparing Spanish Tempranillo’s from the Rioja and Ribera del Duero regions to the Umpqua Valley in Roseburg Oregon. Spain is known for using American oak in their wines (Rioja more so that Ribera del Duero). The Gran Reserva label means that the wines must spend at least two months aging in oak and another three years in the bottle before being released (5 years total). The climates are somewhat similar (Earl Jones at Abacela researched climates in many locations, it is amazing how similar the Umpqua Valley and the two Spanish regions are to each other - read more at this link https://abacela.com/Story/Project.html ). The geology of the Umpqua Valley is unique because the Klamath Mountains, Cascade Mountains the Coast Range converge there. The buckling produced rolling hills along with steep hillsides and some very old, rich soils. This region has a very unique terroir where Tempranillo has found another home. So this tasting features the old world Spanish wines vs. the Umpqua Valley, a region that has yet to be recognized for producing great wines. There were 10 tasters. The order of finish was based on the total points of each taster’s choice of their 1st(5), 2nd(3) and 3rd(1) favorite wines. It was not surprising to me how well Oregon did in this tasting. 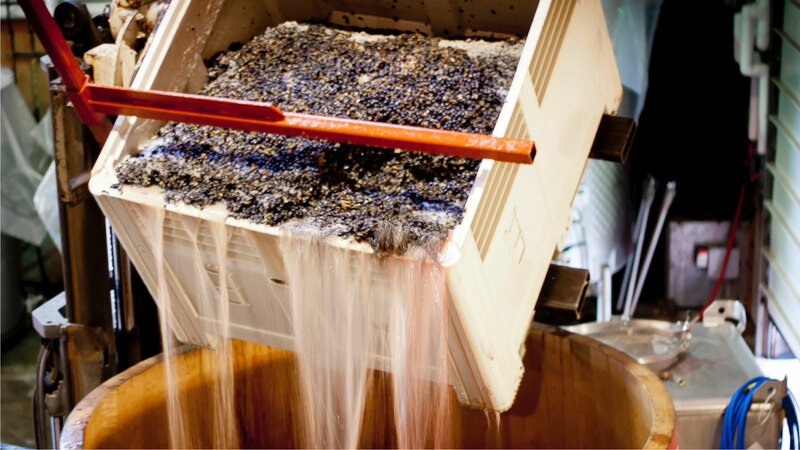 Dyson Demara at Hillcrest uses concrete fermenters so the wines ferment at cooler temperatures for longer periods of time. Abacela makes a Gran Reserva style Paramour, where it spends two years in barrel and then three more in bottle. Jim Delfino uses native yeast to show off their unique terroir. Stephen Reustle uses some American oak to go along with French to give his wines more of a Spanish feel. Even though Oregon is very new to Tempranillo they do it very well. Chablis is a region in the northernmost wine region in Burgundy. All Chablis is 100% Chardonnay. Many are aged without any oak influence. These are very different from New World Chardonnay where the style tends to be buttery and soft. 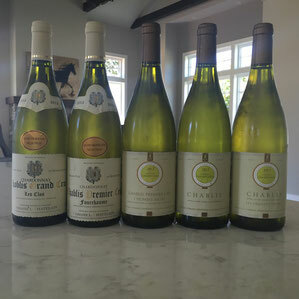 Chablis is known for having a steely quality with a lot of minerality. Unfortunately, the 2013 Fourchaume was corked so it was never tasted. Here are my notes from the tasting. 1. Dull slate, lemon curd/zest on nose. Fresh on palate with floral and citrus elements. 89 Had with scallops and it broadened the wine making it richer and fuller. Improved the wine. Avocado has a similar effect, softening the wine. 2. Dried hay, lemon zest, minerals on nose. Bright acidity with lots of minerals and a zingy finish. 92 Had with the scallops and it brought out a salty quality in the wine, almost like ground up sea shells. 4. Complex nose with many layers. Lots of citrus, key lime pie, baking spice. Palate rich and complex with sweet citrus fruits, pie crust and limestone. 93 As it warmed the acidity increased and score went to 95. These wines were all very enjoyable. They had crisp acidity, minerality and complexity. They were a very good match with the scallops and even the avocado. They did not go well with the fried fish, however. What stood out to me in all of the wines is the minerality. There was some sort of slate, limestone, wet stone or something along those lines in each wine. The 2nd and 3rd had very prominent aromas of the ocean. 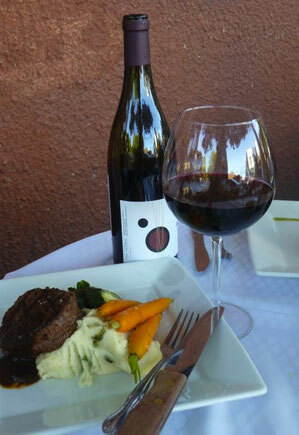 These wines had the acidity to pair well with food, as I discovered with the scallops. Overall, a very solid tasting. Chablis is a region not to be ignored. I attended a tasting at the Wine Country in Signal Hill, Calif. of Pinot Noir wines from the Santa Rita Hills and Santa Maria Valley AVAs in Santa Barbara County, Calif. Most of the wines were rated in the 90s by Tanzer and the Wine Advocate(WA). I was drawn to the tasting for the opportunity to taste a bottle of 2012 Pinot Noir from Domaine de la Cote, a new, highly acclaimed winery that started operation in 2013. 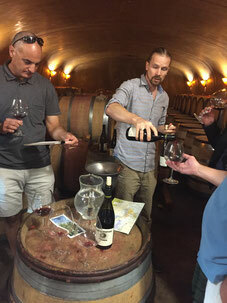 Wine writer Jamie Goode referred to the 2011 la Cote vineyard Pinot Noir($90) from Domaine de la Cote as a wine “that will blow your mind” and rated it at 95. Domaine de la Cote wines are made to reflect their terroir as typified by their 2012 Pinot Noir which was fermented with 50% whole clusters using native yeast and aged in 0% new oak barrels. "Domaine de la Cote is a collection of 6 vineyards planted over 40 acres on the furthest western edge of the Sta Rita Hills appellation: Memoirous (3.5 acres), Bloom's Field (7.5 acres), Siren's Call (3 acres), Clos Juliet (1 acre), La Cote (9.5 acres), and 15.5 acres of appellation Sta. Rita Hills. Dramatically rising to an elevation of 700 feet above the Santa Ynez River, the Domaine lies on an account 25 million year old siliceous (silex) and diatomaceous seabed 7 miles from the Pacific Ocean. Originally part of the Evening Land Vineyards program, the Domaine was purchased by Raj Parr and Sashi Moorman, along with their partner, at the beginning of 2013. Sasha Moorman discovered the site and developed the vineyards with Chris King in 2007. Under his direction, the vineyards were planted entirely to California heritage selections at extremely high vine densities between 4.000 and 7,000 vines per acre, unprecedented at the time for the appellation. Although the Domaine spans a mere 40 acres, the diversity of its climates is staggering: each vineyard has a unique geology, aspect, elevation and microclimate. Such distinct expression of site, or terroir, in such close proximity, is unparalleled in California." The wines that are recommended(*) were all intensely aromatic and flavored with ripe dark fruit but with little of the spicy aromas from oak(except for the Byron) -- in some of the wines this was due to use of neutral oak in aging. They were lush in texture with little apparent astringency and bitterness from tannin and seemed to lack the structure to age well. They didn’t seem to warrant the ratings given by Tanzer and the Wine Advocate. It should be noted that the wines were served at room temperature in a crowded tasting room(> 70deg). The temperature at which Pinot Noir should be served is around 62deg. As the temperature increases, wines taste more alcoholic, more aromatic, show more flaws, are less tannic and seem lusher and less structured, and seem out of balance, which is precisely what was observed. The Alma Rosa at 15% alcohol, was dark purple in color and smelled noticeably of alcohol. The * ratings were based on imagining how the wines would taste if served at the proper temperature. Besides the improper temperature that the wines were served at, it was disappointing that the Domaine de la Cote showed so poorly. It was a nondescript wine that had no aroma and flavor to speak of and was very unimpressive. It certainly was not deserving of the rating by Tanzer. Pinot Noir wines are known to go into a dumb phase especially after being flown, shipped or driven a long distance. My wife and I used to wonder why wines taste better at the winery than they do after buying them at the winery, driving home and then having one for dinner. That the wines from Santa Rita Hills are high in alcohol is not a result of the the winemaker’s choice to make very ripe wines to impress the wine press. It’s merely a reflection of the climate where the grapes are grown. Santa Rita Hills is situated such that its vineyards get enough sun to ripen the grapes and cooling breezes in the evening from the ocean to preserve their natural acidity. This results in a long growing season in which the grapes exhibit dark colors, their stems fully ripen and the grapes develop intense and complex flavors with sufficient acidity to produce balanced wines. Winemakers in Santa Rita Hills are clearly well made using winemaking techniques so that the wines they produce reflect the terroir of the vineyard (native yeast, whole cluster fermentation, and neutral oak or minimal new oak in aging). The wines we tasted with the intensely flavored cheeses(1,3) did not go well with the cheese and were diminished in flavor and lushness by the intensity of these cheeses. The St Andre and swiss cheese also did not blend well with the wines. That the wines didn’t go well with the cheese or didn’t improve might be because the wines were very lush when tasted by themselves and were not astringent from tannin because of the elevated temperature at which they were poured. When cheese is tasted with a tannic red wine, it strips the tannin from the wine and makes the wine taste better(smoother, lusher). The main lesson learned from this tasting was that when going to a tasting in which the wines are clearly served at too high of a temperature(e.g. high alcohol wines) is to mention this fact to the person pouring them and suggest usage of a temperature control unit to store the wines in before pouring them. We tasted the wines in order from least residual sugar to the most. Unlike other tastings we have had this was not blind. Rieslings are categorized as dry (0-4 g/L), off-dry (4-12 g/L), medium (12-45 g/L), sweet (45+ g/L). Winzer Krems - Subtle nose of lemon, spice and citrus blossoms. Palate has peach skin on a long, lingering finish. Finger Lakes - honeysuckle, mineral and orange blossom on the nose. Lime with hints of minerals on a short finish. One of the wines was flawed with a harsh acidity that was similar to having a vitamin C tablet after brushing your teeth. Acid was possibly added. The other wines were a little sweet for my palate. One even had a hint of body odor on the nose. This tasting was done with a group of 12 wine enthusiasts who meet regularly to taste wine from wine regions around the world and to explore and evaluate the matching of these wines with different cuisines. Our group of tasters preferred the old world Rieslings from Germany, Austria and Alsace France to the new world wines from Australia and the United States. The Dr. Heidemanns Dry Riesling was the overwhelming favorite by our group of tasters. The Anne de K Grand Cru Riesling from Alsace and the Winzer Krems Reserve Riesling from Austria were ranked second in the tasting. These three wines were all well balanced and intensely flavored and would match well with a wide range of foods. As I sit in LAX waiting for my delayed flight back to Eugene I figure I should do something productive. 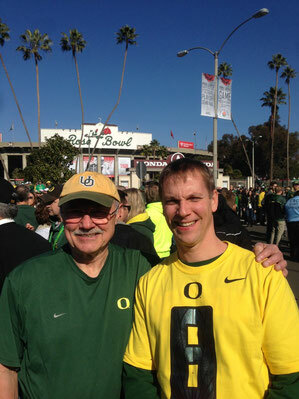 The reason I am here is because I watched the Ducks beat up on previously undefeated Florida State in the Rose Bowl. What a game! I also attended an Italian wine tasting at The Wine Country in Signal Hill, CA. I will go over the wines tasted, along with my notes and then summarize what I took from the tasting. 5 Dill/Fennel on nose. Spicy berries and mineral on palate. More structure, definitely needs time. 88 now, maybe 92 in 5 years. This tasting cost $45 to attend. As you can tell by my scores I wasn’t overly impressed with the wines. A big part of that is because of the style of most of the wines was so tannic, almost undrinkable. I preferred #3 and #4, the lower price wines that were aged in very little oak, or none at all. I thought those wines would pair very well with Italian food. Most of the heavy reds would need a big piece of meat to soften the tannins and I am not sure that would do it. This tasting was very well done with lots of information provided. I have a lot of respect for the people at Wine Country, they have a wealth of knowledge. My scores and opinions reflect my palate and the wine styles I prefer. I am glad I live in Oregon where Pinot Noir thrives in the north and Tempranillo is showing well in the south. "Riesling is food’s most versatile partner, performing miracles with ham, sausages, quiche, omelets, asparagus, artichokes, turkey, pork, chicken and even some red meat. It is the preferred wine with the varied cuisines of Asia (Thai, Vietnamese, Chinese, Japanese), and it can provide relief for mildly spicy foods. No other wine can cover this much ground." This article describes the various wine types and wine regions in Germany and lists the reasons why Randy considers German Riesling wines to be the best in the world. Because German wines have intense aromas and flavors, sweetness and balancing acidity, they pair well with a wide range of foods including spicy food and food served at Thanksgiving dinner. The tasting was ordered by the amount of alcohol in the wines from 13% in the drier Trocken Rieslings to 7.5% in the sweeter Kabinet, Spatlese and Auslese wines. A three star rating system was used to rate the perceived quality of the wines. All wines with star ratings are recommended as good buys. The most intensely aromatic and flavored wines with the best balance and length of finish are rated the highest. Most of the Riesling wines had fruity and flowery aromas and flavors while only a few had mineral and petrol aromas that are common in aged Rieslings. The Weill(#3) Riesling was closed on the nose but had excellent acidity and flavors of grapefruit on the palate. The Trocken wines had the least intense aromas while the sweetest wines (#10, #11, #12 and #13) were the most aromatic and flavorful. 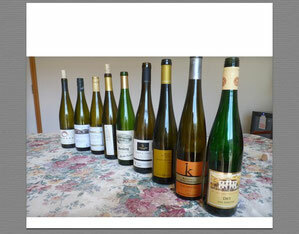 The Armand Riesling (#8) had some petrol on the nose and had more intense flavors than previous wines in the tasting. Although lacking in aroma , the Ehlen(#10) had intense sweet flavors of apples and other fruits and excellent balancing acidity. The Haart (#11) had a complex nose of fruits and flowers with intense flavors and acidity to carry them to a long finish. The Haart (#12) Spatlese was sweeter than previous wines but was very well balanced by acidity. The best wine was the Schwaab Dietz (#13) Auslese that had the deepest color and was the sweetest wine of the tasting but had great acidity to make the wine go well with food. It was intensely flavored and complex and well worth the price. Kevin and Rich went exploring wine country on Friday, Nov. 28th when most wineries are open to the public. The first stop was Coattails in the Chehalem Mountains in Newberg, where we tasted at the Beaux Freres facility. We tasted a “Horsetail” Pinot Noir that was listed at $28, “Coattails” Pinot Noir listed at $74 and a Cabernet Sauvignon listed at $125. We also tasted three barrel samples of 2014 Pinot Noir. The “Horsetail” Pinot Noir was very light and spicy. Not a lot of concentration or length of finish as one might expect at this price but a well made wine. It didn’t amaze but was well priced at $28. I gave this wine an 88. The “Coattails” Pinot Noir was a crowd pleaser but a little over the top for me. While the concentration was higher the oak influence stood out with this young wine. It was a bigger style with plenty of structure. I gave it an 87, the price bringing down the score a little bit. The final wine was a Cabernet Sauvignon. I didn’t score the wine because it wasn’t grown in the region. The second place we visited was Crowley. They had a tasting with about six smaller wineries. We purchased three bottles (Et Fille, Crowley and Toluca Lane), we will write up results when we blind taste them. The third place we visited was Longplay in Newberg. The owner, , put on some classical jazz and poured us several Pinot Noir. We tasted Lia’s Vineyard and Jory Bench Reserve of both 2011 and 2012. The Lia Vineyard 2011 and 2012 was $27. The 2011 displayed bright red fruit and spice notes. I enjoyed an elegant styled wine that showed bright red fruit and had a nice finish for the price. I gave the wine a 90. The 2012 was riper as it should be (2012 was a warmer year than 2011,) it still had bright acidity and displayed herbal notes of sage. I liked the 2011 slightly more because of the brightness, I gave this wine an 89. Then we tried the 2011 and 2012 Jory Bench. The 2011 was very elegant, what I would call a feminine wine. It had red fruit, floral notes, a hint of mushroom, quite a bit of complexity for a $38 Pinot Noir. I gave it a 92. I very much enjoyed this wine. The 2012 was more of the same only a little darker fruit and more earth. I preferred the 2011 only slightly, I gave this a 91. This was a pleasantly surprising line up. I like the fact that these wines were elegant, far from over the top. They emphasized fruit, not oak. Throw in your choice of music while you are tasting and I highly recommend visiting this winery. The fourth place we visited was Brooks between Amity and Salem. Rich had never visited this winery before. They are known for Riesling and Pinot Noir. 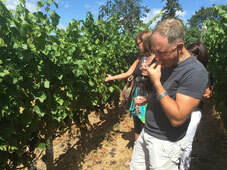 The first wine we tasted we tasted was the 2011 Willamette Valley Riesling. The aromatics were very impressive right off the bat, lots of citrus and minerals. Talk about acidity! This was like sucking on limes with limestone notes. Searing acidity made my mouth water. With very little sugar to hide the acidity, it wasn’t shy revealing what it was. I gave it a 91. The next wine was the 2011 Ara Riesling. This didn’t have quite the intense nose the Willamette Valley had, but it was pleasing and subtle. Showing a hint more residual sugar I noticed more peach with citrus fruit on the nose. Not quite as searing on the palate, it had noticeable acidity but more stone fruit on the finish. I gave this wine a 90. I imagine most people would score this higher than the Willamette Valley because the slight residual sugar balanced it out. I preferred the Willamette because of the boldness of the acidity and minerals. It had an identity and it wasn’t shy about it - I like that. The third wine we tried was the Bois Joli Riesling. It was just under 3% residual sugar. A food friendly wine that had great balance of acid and sweetness. I got pure peach on the nose and palate, slight hints of minerals and citrus were noticeable. A balanced Riesling that would compliment many foods. I gave this wine a 91. All three Rieslings were very impressive. The first Pinot Noir we tried was a 2011 Janus. Like Tanzer I gave this wine a 91 because of the balance of earth and red fruit. At 12.3% alcohol this wine is far from over extracted, it demonstrated earth as well as ripe fruit. The nose was impressive to me, a wine I wanted to swirl over and over. The next wine we sampled was the 2011 Temperance Hill. 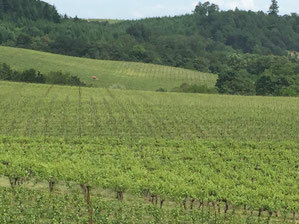 This vineyard is at a high elevation in the Eola-Amity Hills. It showed coniferous forest and red fruit on the nose with hints of herbs. The intensity of the nose was lacking but I assume that a little time will bring out the best in this wine. The palate was elegant and balanced showing off a brightness as you might expect at 12.2% alcohol. What a refreshing change having wines that are below 13% rather than the opposite end of the spectrum!. I gave this a 90, a point less because the nose was less pronounced. The final wine we sampled was 2010 Rastaban was a small 300 case production that Steven Tanzer gave a 93 point score. I gave it a 90, just slightly less than the other two Pinots. The nose was very subtle and the palate had a little more spice than I was expecting. A very nice wine but I preferred the Janus at $38 compared to this at $55. 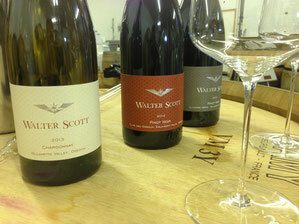 We finished the day at Walter Scott, a place I had visited on several occasions. We tried three chardonnay’s and four pinot noirs. All I have to say about this winery is that it is a must see. All the wines are well made, having a nice balance. Ken Pahlow and Erica Landon love picking early so that the wines demonstrate a sense of place and maintain the vibrant acidity of the Eola-Amity Hills. I didn’t rate any of the wines under 90 points. This is one of my favorite wineries to visit. It has been a busy summer at Oregon Vine2Wine. The Willamette Valley set a record for number of days above 90 so the harvest has already started! 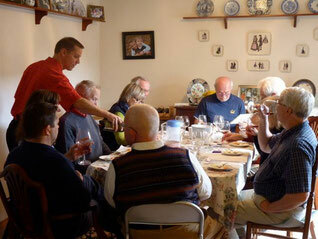 I was fortunate enough to make time to attend a recent blind tasting featuring Pinot Noir from Oregon and California. Each bottle was in a brown bag and there were 3 mystery wines to throw people off as well. I wanted to share the results and my impressions. The wines ranged in age from 2007-2013 so we had a wide range of vintages. The three mystery wines threw us for a loop as well. 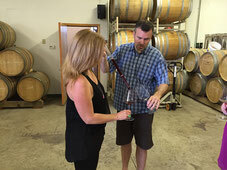 During a typical Oregon vs. California tasting it is normal to find California wines showing more ripe fruit - raspberry and stewed strawberry - while Oregon wines show more herbal notes, cherries and spices. Oregon wines also show a lighter color because of cooler temperatures during the growing season, sometimes a giveaway when blind tasting. I had four the five California wines pegged after the first round (Walter Hansen being the lone excetption because it showed earthy notes on the nose). Determining the producer of the Oregon wines proved more difficult since the 2007 Penner Ash showed very little signs of aging. I usually count on color to give me some hints in guessing where wines come from. Overall, I was impressed with the lineup and had Oregon slightly ahead of the California competition. As a group we voted for our top 3 - 3 pts for 1st, 2 for 2nd, 1 for 3rd - the results were as follows: 1st Shea (25 pts), 2nd Penner Ash (14 pts), 3rd Loring (8 pts) 4th Archery Summit (4 pts), 4th Brewer Clifton (4 pts). I ranked Shea first like the group, but had Loring 2nd and Archery Summit 3rd and Penner Ash 4th. This was an educational tasting where wines varied in ages and price. I think if all wines were served at cellar temperature results would have been different. 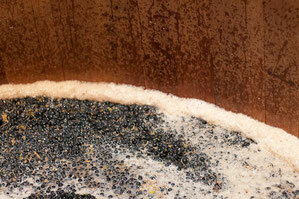 It is amazing how much temperature influences the aroma and flavor components of the wine. Alcohol is emphasized in warmer conditions and tannin is emphasized in cooler conditions. It is very important if you are holding a tasting that temperature is taken into consideration. Tasting Pinot Noir is something that is unique. These wines show an elegance and complexity that I haven't experienced in other varietals. They can be fruity, earthy, show minerality, and showcase aromas that can't be put into words. Each terroir is unique to region and each region is unique within a specific site. I have yet to find a grape that excites my palate like Pinot Noir. It is also a grape that is not widely appreciated in the United States. It has higher acidity and it is thinner skinned so the varietal has a lighter body than bigger/bolder reds. However, once you taste a truly great Pinot Noir, you will find that there is no other grape you would rather drink. In my blind Pinot Noir tasting experiences, Oregon wines tend to not show as well because they are not as big and fruit forward as California wines. I provided both of the Oregon wines in the tasting - the 2011 Estate from Ayoub (rated 94 by the Wine Advocate) and a 2010 Scott Paul Audrey (93 from Tanzer). I felt going in that the Oregon wines were at a disadvantage being so young and from cooler vintages. 2011 was a very cool vintage and produced wines that are higher in acidity and lighter in color. The wines were highly rated from various publications. The first time through the wines I picked out the Oregon wines based on having a lighter color and picked out the two Burgundy wines based on their earthy aroma. The six California wines were a different story. All were darker in color and most had a very ripe aroma - the Belle Glos smelled like stewed strawberries. My top three wines were the Domaine Faiveley ($95 retail), Zotovich (I would later change this), Scott Paul. There were ten people at the tasting and we did a total count for everyones top three (3 pts for 1st, 2 pts for 2nd, 1 pt for 3rd). For the group the Talley was 1st (13 points but I didn't rank it in my top 3), Zotovich was 2nd with 11 pts (I had this 2nd the first time through) and Domaine Faiveley was third with 9 points. After the wines opened up for a couple hours I retasted them. The Zotovich had completely fallen apart, having no aroma and a lot of alcohol came through on the finish. The Domaine Faiveley was even better, showing a very complex mushroom/cherry nose and great balance on the finish. I thought the Scott Paul was improving and the Ayoub was much better as well. It is hard getting enough wine lovers together for a blind tasting where the bottles are similar price point and close to the same age. Wine #10 Domaine Joblet 1996 did very well for an older wine but due to its aged color (slightly brick) and aroma, it was easy to detect from the younger wines. The two Oregon wines were too young for this tasting but I think both of them will get better with age (they are already very good). This tasting showed me that wines that have riper fruit aromas/flavors and higher alcohol do well in blind tastings. The more subtle and delicate wines don't do as well. 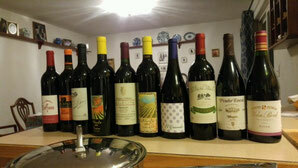 One of the goals of this tasting was to see if we could identify which wines were from Oregon, California or Burgundy. Most of the tasters were successful in doing that. I will attend another blind tasting in a few weeks that will focus on value Pinot Noirs ($6-$25) to see if we can identify wines of exceptional value. Santa Rita Hills is a cool climate but produces high alcohol wines with balancing acidity because it has a longer growing season with cool evenings. I tasted in that AVA a few years ago. Some of the Pinot Noir I tasted showed hints of ruby grapefruit while having 14.8% alcohol. These higher alcohol wines don't age as well because as wines age the tannin, which balances the alcohol when young, recedes and alcohol becomes more prominent. 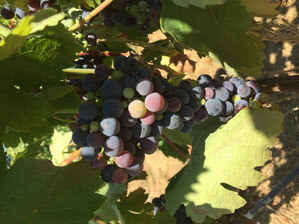 California, in general, produces more fruit forwards wines and the fruit tends to be riper (more darker, lush fruits compared to brighter red fruits). Oregon wines are less fruit forward as a whole and have a lighter color. Burgundy often produces wines with an earthy aroma. Both Burgundies in this tasting were given away by their earthy aroma.